Cigars of the Pharaoh (Original: Les Cigares du Pharaon) is the fourth comic of Adventure of Tintin series. The comic published weekly from December 1932 to February 1934 at Le Vingtième Siècle for its children's supplement Le Petit Vingtième. The comic is colored in 1955. You will get colored edition here. Tintin meets with an Egyptologists (Sophocles Sarcophagus) who have been trying to find lost tomb of the Pharaoh Kih-Oskh. They are soon involved in the search themselves and find a tomb filled with dead Egyptologists (including Tintin and Snowy!) and boxes of cigars. Following the mystery of these cigars they travel across Arabia and India, and reveal the crime of an international drug smuggling cartel. 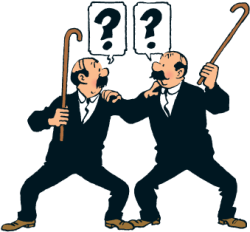 One of the most famous characters Thomson and Thompson first appeared in this comic.